If you are like me, you don’t just collect your favorite license in one scale or format. 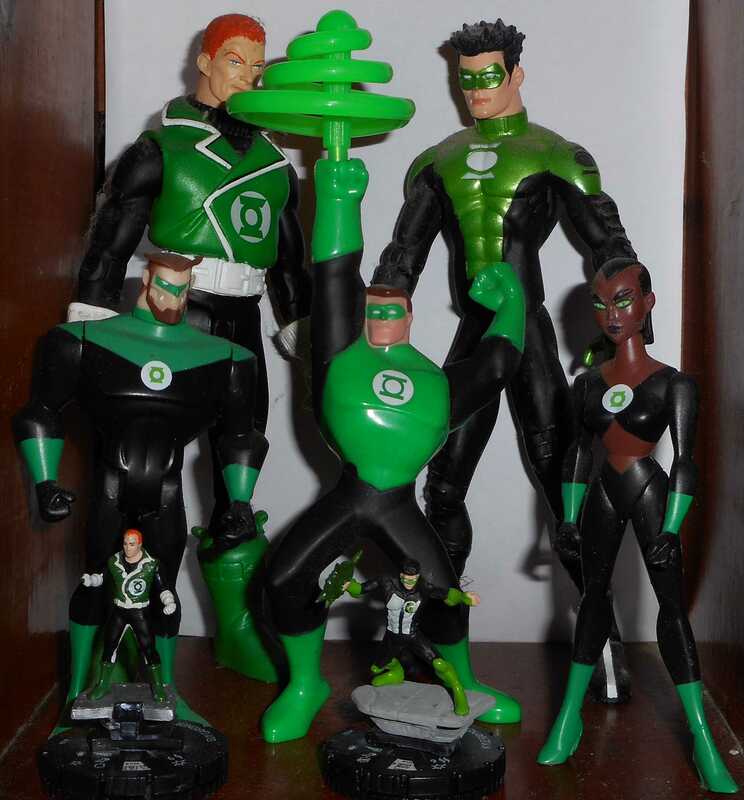 One license that has gotten better over the past few years than before is Green Lantern. Yes, we got a movie a few years ago, but the real key turning point was when someone said, “What made you think there was only 1 yellow ring?” That ushered in the Sinestro (yellow lantern) Corps which was quickly followed by the Red, Blue, Orange, Indigo and Sapphire (violet) Lantern groups. Then we got Black and White Lanterns. 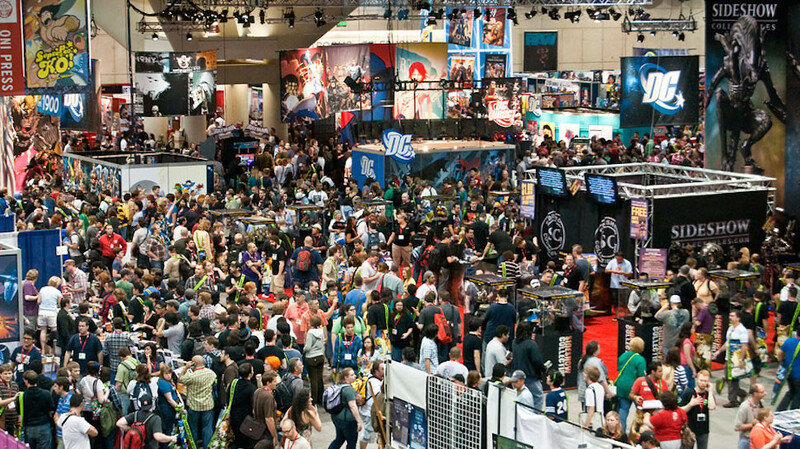 We collectors and fans have been blessed with action figures in numerous scales and t-shirts. But I’m here to talk about some other stuff. Rings. 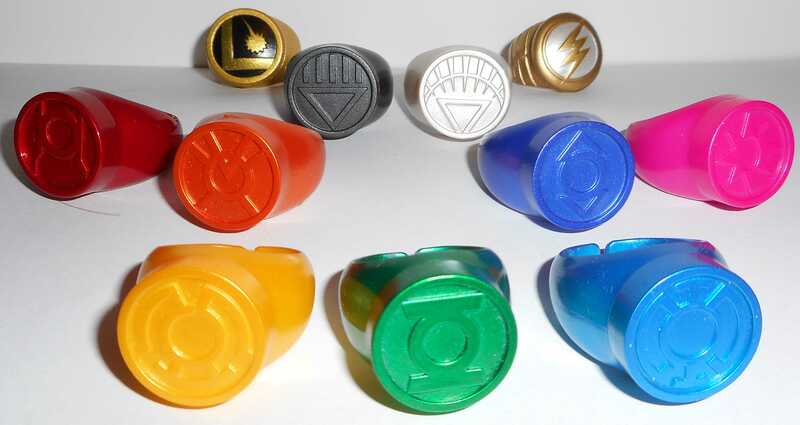 The first thing we were offered were rings in each of the 9 colors, given out during the 8 month, Blackest Night comic book cross over story. These were free with the purchase of a specific comic book. I am sure these were lower selling titles that DC was hoping would get a sales boost. It did for that month, but not for much longer than that. Batteries. 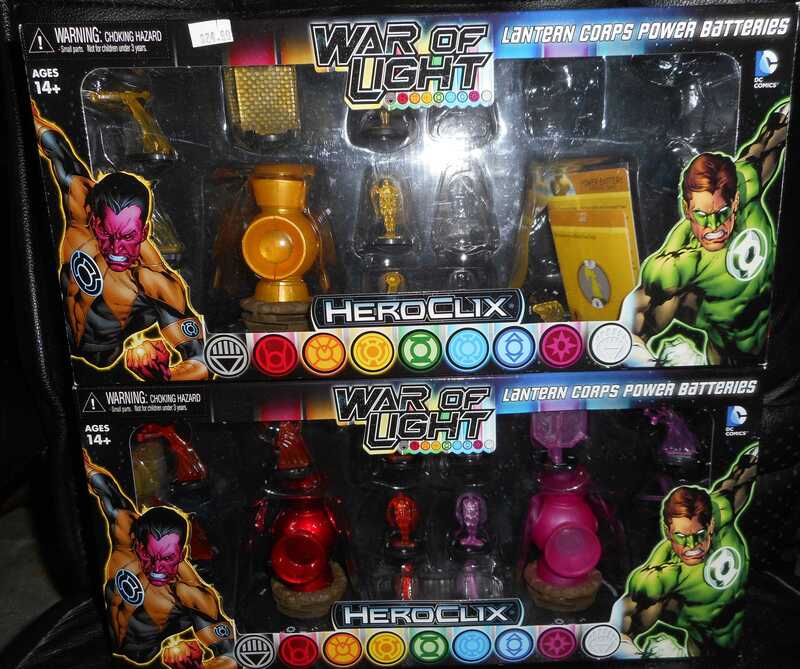 My favorite collectible game, HeroClix, ran a 6 month event called War of Light. 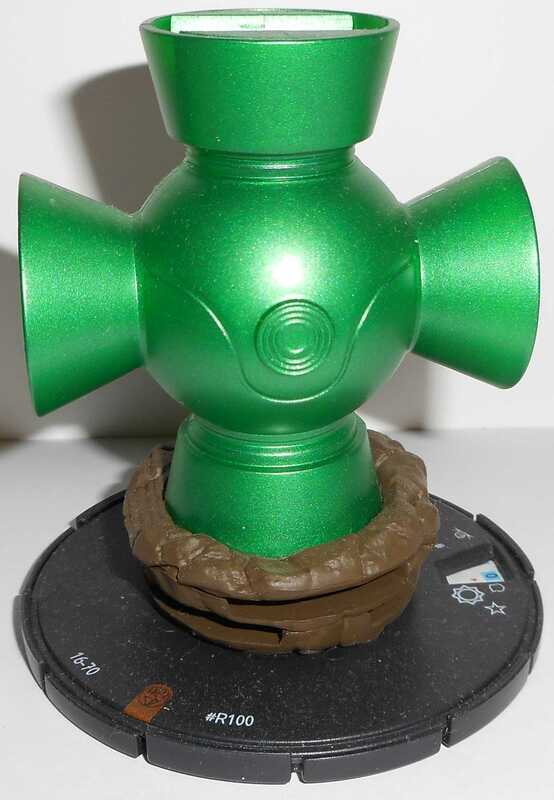 If you went to the first month, you got an approximately 4 inch high representation of the Green Lantern Central Power Battery. Yes, it has game mechanics, but it also makes a nifty display piece. Rings Again. 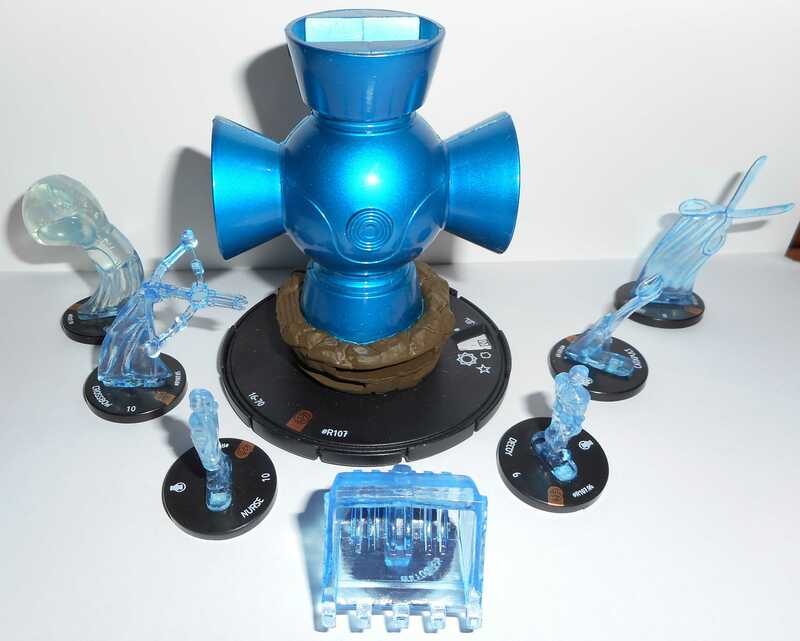 As part of this event, there were exclusive boosters of figures in which approximately one out of 3 boosters had a ring. Visually, these are almost indistinguishable from the comic ones. 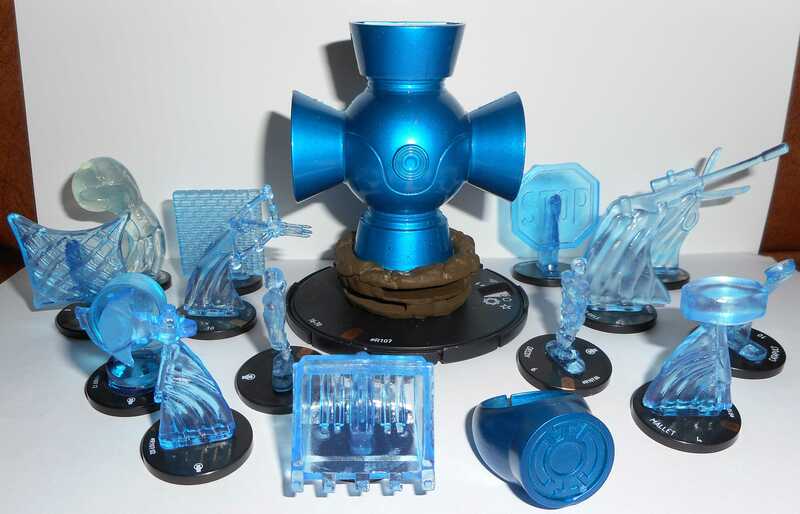 If held side by side, the game ones have the word “Heroclix” on the inside. Constructs. Each month,. for 6 months, as you attended each event, you also got as a participation reward, a single construct. In the game, these interact with the battery and general pieces, but in terms of collecting, they look pretty cool displayed around the base (They also fit into the side of the base, but during the game they tend to fall out on me). Batteries II. Someone at WizKids understands the idea of reuse. Those of us playing now had a Green battery we had gotten for free. Could we be persuaded to buy batteries in the other colors? Yes, some of us could. While the green ones are cheap on the secondary market, the other colors tend to run much more expensive because the same marketing dept did not order enough supply to meet demand. Originally sold in pairs of batteries for 25$ a set, expect to pay up to 25$ for a single battery at this point. Note that each battery should come with 7 constructs of its own in the matching color in order to be considered complete. Blue Lantern Central Battery, Constructs – note the plow. Constructs II. Wait, did that say 7 constructs, but I only mentioned 6 months of prizes when you got green constructs? That is correct. Each colored battery came with a 7th exclusive shaped construct. 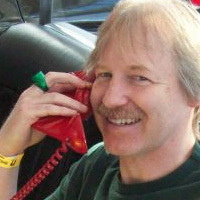 Cue the marketing reuse guy again. The 7th shape from each color was re released in all the other colors blind bagged in an even rarity for 2$ each retail. You can still find these at retail (local gaming store). Blue Battery and All 14 Constructs. Green Again. Yeah, to get a full set of green, you have to jump through some additional hoops I would be remiss not to mention. 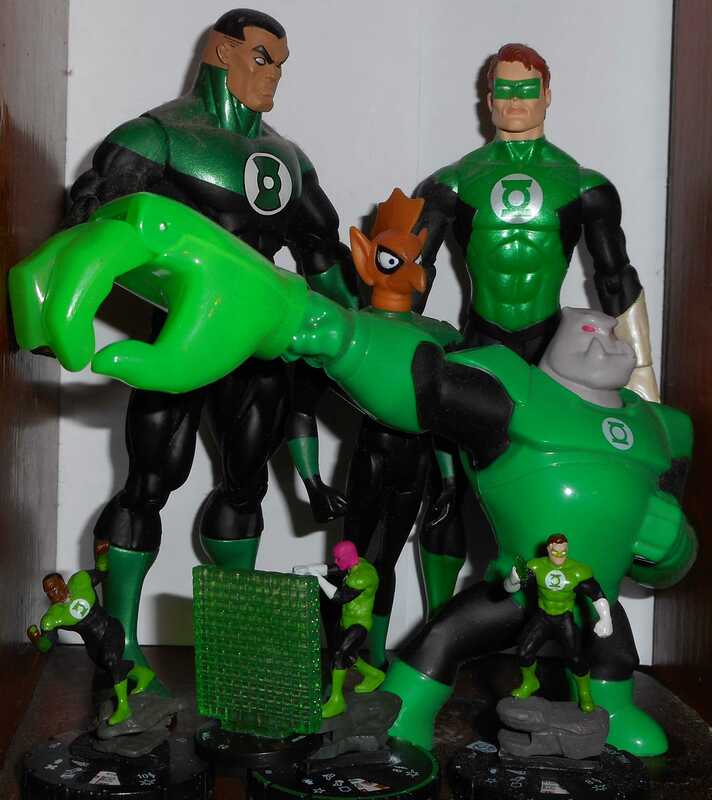 1) The ring and an additional construct (a shield) – still unique to green – come in the Sinestro Corps War scenario pack, which runs for 20$ if you can find it. 2) Four of the green constructs (axe, mallet, net, wall) came in those exclusive to the event boosters I mentioned above, packed in with very specific and rare pieces, 1 in 10 boosters had such a piece with a construct. Pricing. Finally, because of the format of these events which featured exclusive pieces, players went and played in multiple events each month so they could have another chance to get the pieces. This has led to a lot of players with multiple and unneeded Green Batteries and the 6 monthly green constructs. You should be able to pick up the green battery and those 6 constructs fairly cheaply on the secondary market. You should also expect that the green constructs which came in boosters will be more expensive than the others.